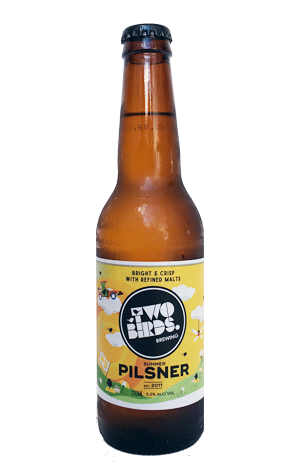 If you're stinging for some Kiwi hops this summer, Two Birds Brewing has you covered. The unmistakable essence of South Island lupulin goodness is the defining character of the Spotwood brewery's new seasonal release. The fruity aromas are as sharp and crystalline as the beer is gleaming and golden: they reckon white peach and freshly crushed grapes, we'd add gooseberry to the mix too – not to mention something recalling the lively herbal kick of a South East Asian salad. It looks rather lovely with its persistent, dense, whitest of white heads (some might say it's like a long white cloud), the bitterness is tight and pretty potent for a summer quaffer and it comes delivered with the usual Two Birds finesse. Roll on summer.